It’s Lillard time. The Trail Blazers enter the playoffs with Damian Lillard leading the way. Start the NBA Playoffs by reliving great moments of the season and seeing what it took to make it. 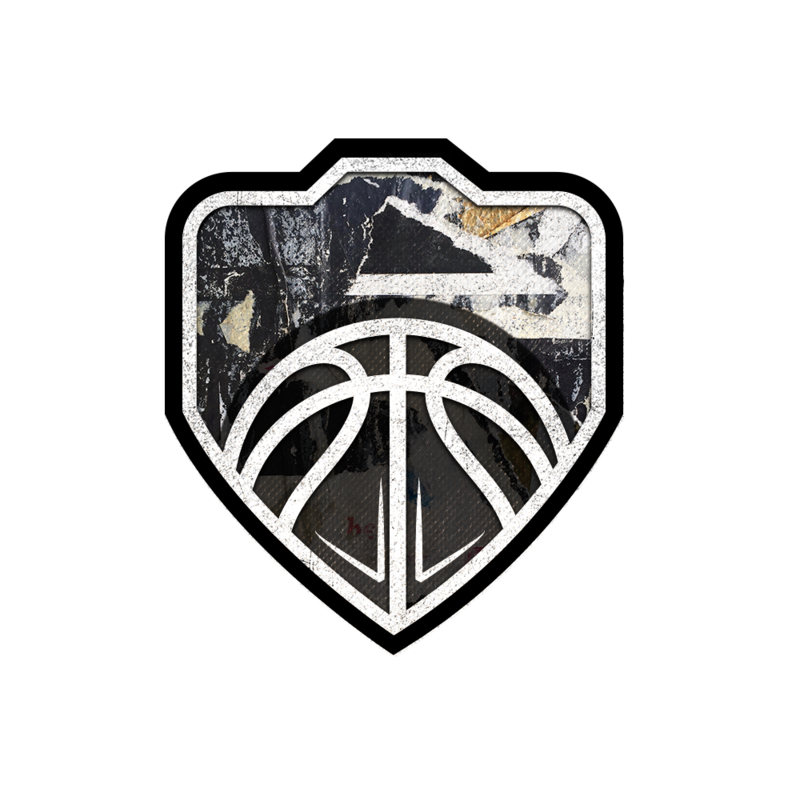 Take charge of the Trail Blazers and advance your Damian Lillard to top OVR (and unlocking amazing boosts and abilities) while you usher the team into the first round of the NBA Playoffs! Play the events to earn Gold Playoffs tokens. Turn Gold Playoffs tokens into Elite Playoffs tokens that will be used to level up your 2019 Playoffs Damian Lillard in Sets. There are 5 sets of Story Progression Events. The Story Progression Events cost no stamina to play, but are first win bonus only. They reward 400 Coins, 200 XP and between 1 and 3 Gold Playoffs tokens. These events are not required to begin or complete the campaign, but are there to showcase the Trail Blazers’ journey with Damian Lillard as their leader through the season to the first round of the NBA Playoffs! There are 3 Blitz Events: one for 25 stamina, one for 50 stamina and one for 75 stamina. These events reset their first win bonus every 8 hours and award Gold Playoffs tokens. Once you earn Gold Playoffs tokens from both the Story Progression Events and Blitz Events you then combine the Gold Playoffs tokens into Elite Playoffs tokens. 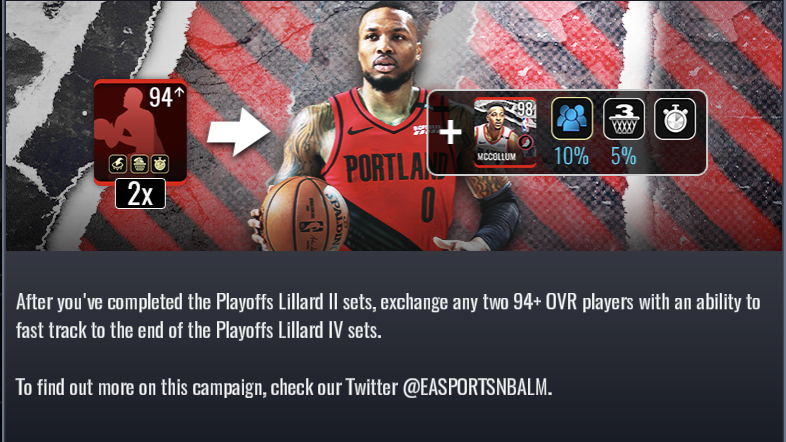 The elite tokens are used to upgrade your 2019 Playoffs Damian Lillard to 101 OVR with special boosts and ability and unlock 3 fellow Trail Blazer teammates. After you've completed the Playoffs 2019 II sets, exchange any 2 Season 3 players with abilities to fast track to the end of the Playoffs 2019 IV sets. You can purchase the Playoffs Starter Special and other packs in the Store. All levels of Damian Lillard are NOT auctionable until the end of the campaign. Trail Blazer teammates Aminu, Nurkić and McCollum are auctionable during the campaign. 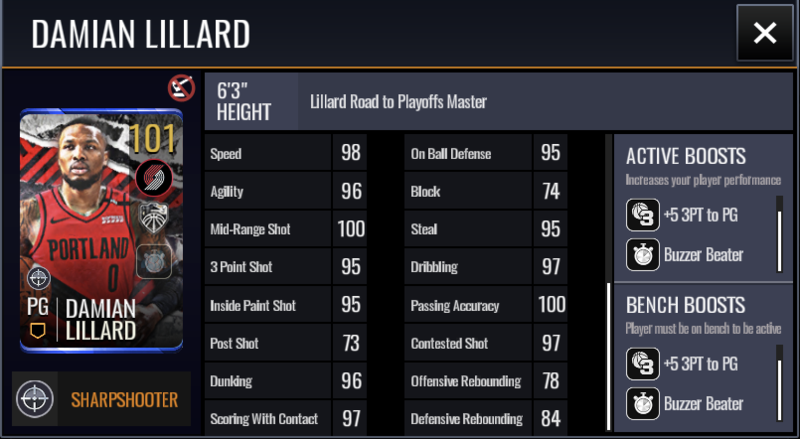 There is one Master and 3 Teammate players you can earn in Playoffs Round 1: Lillard Time. You can use any Season 3 players with abilities to fast track to the end of the Playoff 2019 IV sets. This might be the worst promo of the season. Too early to judge though. His pic shows +5 3pt boost to pg, active and bench. So, does he give +5 to himself? He’s only has a 95 3 attribute otherwise. This is really disappointing. I have no idea why they thought it was a good idea to make the first Playoffs promo all about one player. Looks like a good time to take a week long break from the game. Hopefully the 2nd round promo is better. Just wondering how much fun it actually is to rehash a 3 month old idea. Is that what the kids call "designing" these days? Also, since it's P2W like Harden, they're about to make things not so fun for the regular folk who don't spend a lot. Another BB right after both Tenement masters have abilities. So now we're back to Xmas when Ghosts came out & you had to face teams with 5 abilities. Someone tell EA that doesn't make the game more fun for the majority. Just design better Masters, offer P2W a higher OVR version, and give them better skill boosts. Stop giving out abilities to every player. If you can't fix the wack gameplay issues we all constantly complain about, at least throw us a bone regarding abilities. I also don’t understand why the promo is about one guy. I wish they’d cut and paste LNY instead of the Harden campaign. Clearly, all the good first round cards will be in the store. ..... And it's about one guy who has a weaker card than MM Westbrook that most ppl just got for free. If you aren't paying are you really excited about weaker card with a fan boost that doesn't make any difference...... since it isn't hard to get Legend in SD in the first place and the rewards for SD are all poop anyways?????? I'm very busy until about May 1st so I guess I'll skip this promo, it looks pretty bad. Sigh.. I'll stick to completing 102 Horry. What in the Waggoner is "Changes made in this Campaign". The only change made is that u use 2 instead of 1 previous ability player for the short cut from the copy paste campaign. Is he trying to mock us or himself. This is what happens when Kid Waggoner "designs" a promo. I would like to say shake my head but I really wanna shake his head. Maybe just maybe instead of scoring a three pointer, it’s score a fade-away three pointer. Or score a lay-up or a dunk maybe it’s change to score an dunk thru an alley-oop. Maybe he designed a bunch of new drills or something. I don’t know i’ll Guess we’ll just see it in 8 hours 38 minutes. This is highly disappointing but expected. Since its like the Harden campaign I know I'll only get to 101 Lillard with 6% fans so I'll put him in my SD lineup and call it a wrap for this round. Brian is so defensive yet it's clearly just a copy paste, yeah some events may be different but c'mon! This would have been the perfect opportunity to give us auctionable content needed for the sets, bundles with guaranteed toppers, a new campaign format, introduce 102 ovrs, introduce new or rare boosts like contested shot, on ball defense etc. Missed opportunity here for both players and EA. If the next rounds are the exact same format and all 101s then thats just lazy design.